In China’s less prosperous provinces, people often become commodities. It is not just white slavery either. Evidently, there is also a market for physically pitiable children for professional panhandling rings. 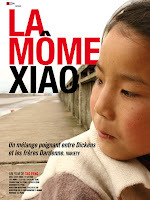 Such a fate befalls one eleven year old girl in Peng Tao’s Little Moth, which screens tomorrow at the Asia Society’s ongoing series of independent Chinese cinema. Poor Xiao E’zi ought to be up and walking. She suffers from a treatable but degenerative blood disease that has paralyzed her legs. Instead of paying for treatment, her deadbeat father sells her to a couple embarking on a professional begging career. Her new “father” is a grasping sad excuse for a man, but at least her new “mother” shows some maternal instincts. Eventually, Xiao’s “parents” meet a colleague who runs an older one-armed boy with a burgeoning rebellious streak. Seizing an opportunity, he runs off with Xiao, but their troubles (and tragedies) are just beginning. 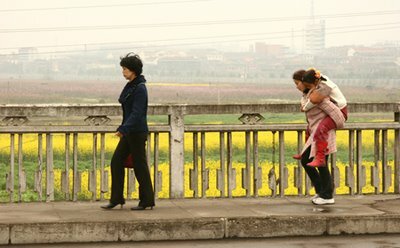 As depicted in Moth, life for those on the fringes of Chinese society is shockingly exploitative—even predatory. Unless your heart is completely made of stone, it will ache for this little girl throughout the film. In fact, any halfway sensitive viewer should be strongly warned, this film could be very upsetting. Filmed in a “digital generation” Vérité style, Moth is disturbingly realistic. Its injustices will likely outrage many viewers. Some might also get upset with Peng, who ends at a rather unsatisfying juncture. Presumably that is the point though. This is socially minded cinema at its most manipulative and effective. Though young Zhao Huihui hardly speaks, she is absolutely convincing as Xiao (whose name means “Little Moth”). A sweetly endearing and ultimately haunting screen presence, she carries the audience in the palm of her tiny hand. Likewise, Zhang Lei is completely natural and unmanne red as her would be protector, who is ironically aging out of the crooked jacket he was sold into. While Moth shares the extremely naturalistic approach of many independent Chinese filmmakers, it has a very clear narrative thread. There is real danger and considerable double-dealing, though Peng chooses to de-emphasize the potential thriller aspects of her story (adapted from a novel by Bai Tianguang). It is certainly an example of a director masterfully controlling the audience’s emotional responses. Angry and heartrending, Moth packs a walloping emotional punch. It screens at the Asia Society tomorrow night (4/2).